A while back +Dolly Parton and +Dolly Parton’s Imagination Library asked people to share with us their amazing Imagination Moments about how the Imagination Library has impacted their family! The response we received was terrific as stories arrived from across the globe. We invite you now to take a look at our top 20 finalists and vote for your favorite Imagination Moment as we share these heartwarming stories through the holidays! While you’re clicking around, be sure to add us to your circle on Google+! Vote for your favorite Imagination Moment. About Dolly Parton's Imagination Library - In 1996, Dolly Parton launched an exciting new effort, Dolly Parton's Imagination Library, to benefit the children of her home county in East Tennessee, USA. Dolly's vision was to foster a love of reading among her county’s preschool children and their families by providing them with the gift of a specially selected book each month. By mailing high quality, age-appropriate books directly to their homes, she wanted children to be excited about books and to feel the magic that books can create. Moreover, she could insure that every child would have books, regardless of their family’s income. The Council of the Federation Literacy Award recognizes the valuable contributions made by Canadians across the entire spectrum of the field of literacy, including family, Aboriginal, health, workplace and community literacy. It is presented to educators, volunteers, learners, community organizations, and businesses in each province and territory. Premiers created the award in 2004 to recognize the importance of literacy as a major factor in Canadians' ability to participate as full and active citizens in all areas of society. Dolly's efforts to expand Imagination Library land foundation president in Australia! Dolly has made her way to beautiful Australia where she is wowing fans on stage as part of her Better Day world tour but she's not just pickin' and grinnin'. Dolly is on a mission with her friend, David Dotson (president of The Dollywood Foundation)! That mission is to figure out how they can make her Imagination Library available to the children of Australia! This blog post is a chronicle of David Dotson's (DD) travels across the country to try and make Dolly Parton's Imagination Library a reality in Australia. Today is a day off-although I never stop thinking about how Dolly Parton's Imagination Library will or won't work here. Headed to the end of the earth -southwestern Australia --the Margaret River area is just beautiful. Although no kangaroo has introduced himself to me, I did hear a kookaburra. The bird sounds like a maniacal monkey! Next stop today is a lighthouse that sits at the meeting of the Indian and Southern oceans- a great place to contemplate the mystery of the universe. Tomorrow are meetings in Perth and then fly back to Sydney. Next year is the National Year of Reading in Australia so if we do move forward- then this would be a perfect time to do it! When my husband was deployed to Iraq, our youngest son and I would read each day as something to pass the time and kind of distract us from watching the news or thinking about missing his Daddy quite as much. I would let him choose books and they were usually ones he received from Dolly, as he would put it. He loved the Max and Ruby books and it was part of our daily routine he and I enjoyed so much. He grew to love reading on his own and I attribute a lot of that to our reading time during that period in our lives when the books he loved from the Dolly Parton's Imagination Library were so important in our routine. His enjoyment of reading lead him to the story of the Titanic, and in Third Grade he was chosen to take part in the Sevier County Young Authors Conference, he decided to write his book about the Titanic and facts he thought other children would enjoy. One day while we were at the Museum unable to go in because they were sold out, he pulled his book out and began reading facts he had written to my Aunt who was visiting. One of the Crew Members noticed him and asked to see his book, then told him he needed to meet someone. He introduced Luke to Mrs Mary Kellog Joslin who asked Luke if she could have his book published to sell in the Titanic Museum, he was 8 years old when he wrote and illustrated his first book. This chance meeting has been one of the greatest blessings in our lives, and we know that it all started with his reading along with me from the Bible and the books he loves from Dolly’s Imagination Library. The JLK Dolly Parton Literacy Grant was created to honor Dolly Parton and her efforts to promote early childhood literacy both locally and around the world. Grant applications were accepted from Knox County public schools, pre-schools and libraries demonstrating a need for funding to promote childhood literacy programs. 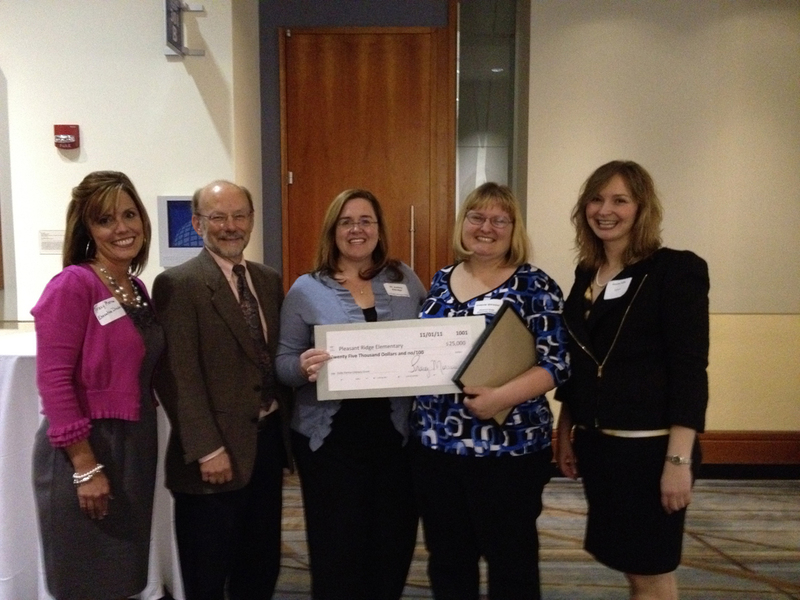 The $25,000 grant was awarded to Pleasant Ridge Elementary School on Tuesday, Nov. 1, 2011 at 7:15 p.m. at the Knoxville Convention Center. Pleasant Ridge Elementary School received the JLK Dolly Parton Literacy Grant to provide funding for their Destination Unlimited: Oh! The Places You’ll Go! program. This is a school-wide reading program geared toward assisting students, a majority of which are at-risk, in increasing reading achievement. The program consists of exposing students to different genres of literature, increasing children’s access and choice of books, increasing reading strategies among their students and promoting family involvement in developing successful readers. One of the most notable portions of their grant application was the rain gutter component. The schools’ Dad’s Club will install rain gutters in the classrooms, gym and cafeteria to serve as bookshelves. This type of “shelving” is very economical and will allow the books to be displayed by their cover versus the spine of the book, therefore increasing the books’ appeal to children. Books will also be available in tubs on school busses so that the children can maximize wait time with learning opportunities. 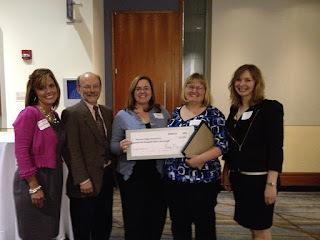 “The Junior League of Knoxville is very pleased to support Pleasant Ridge Elementary School’s literacy initiatives. Its imagination and ideas are exceptionally creative, and we can’t wait to see the school’s dreams become reality through the JLK Dolly Parton Literacy Grant,” said Tracy Morrow, JLK’s Executive Director. The grant has been made possible by donations from a group of JLK Sustainers who have donated annually to the JLK’s Community Circle Annual Fund. A list of Community Circle members can be found on the JLK’s website.